Starting October 2020, TSA will require travelers to bring a REAL ID compliant driver’s license or other previously accepted forms of ID. Travelers may have to take a trip to the DMV if they’re looking to fly, even domestically, after October 1, 2020. The Transportation Security Administration details on their website that they won’t be accepting standard driver’s license as form of identification to board domestic flights. TSA says that travelers will be required to present a REAL ID compliant license in order to travel within the U.S. The new requirement will only be applied to travelers over the age of 18, minors won’t be required to have one if they're traveling with someone. Drivers can generally tell the difference between a REAL ID and a standard license by a star marked in the upper portion of the card. The stars range from gold or black to star cutouts in gold or black circles. 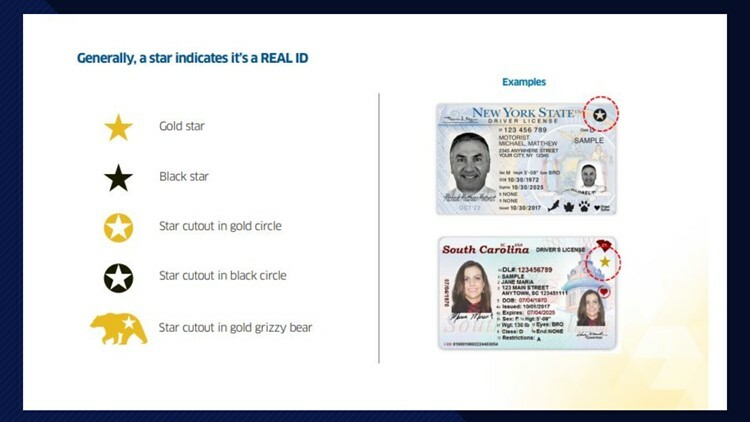 California's REAL ID marking is a star cutout in a gold grizzly bear. If there’s no star, then it’s likely a standard license and not REAL ID compliant. Homeland Security fact sheet showing examples of REAL ID markings on driver's licenses. But that's not the case for every state. In Washington state, an enhanced driver license (EDL) or enhanced ID card (EID) are REAL ID Act compliant, but aren't marked with any special star. TSA will continue to accept other forms of identity documents, such as passports. To see a list of accepted travel documents, click here. The agency explains on its website that the REAL ID Act was passed by Congress in 2005 and recommended the federal government to set specific standards when issuing identification documents, such as driver’s licenses. Some states are already compliant with the law, but others aren’t. To find out if your state is already REAL ID compliant, click here.